We cover all kinds of drag racing here at Motor1.com. We love it, and we know you love it, but it occurred to us recently that almost all the drag racing videos we feature involve cars of a sporting nature going head-to-head. Occasionally there are some crazy-fast SUVs thrown in there – usually from the likes of Hennessey – but one thing we don’t see very often is pickup trucks duking it out. That’s ironic considering just how popular trucks are in America. And folks, they’ve never been faster. The guys at The Fast Lane Truck know this, and recently had occasion to line up nearly all the big players in the half-ton pickup world for some drag racing action. 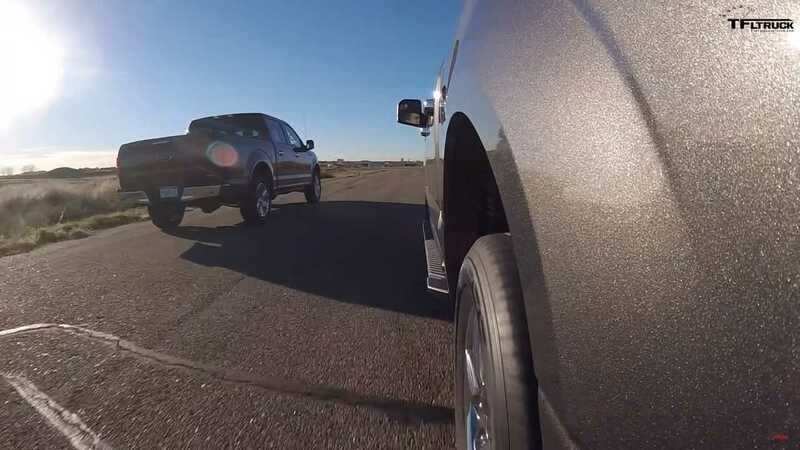 Specifically, the crew had a pair of Ford F-150 trucks with the 3.5-liter EcoBoost V6 and 5.0-liter Coyote V8, a pair of Ram 1500 pickups with the 3.6-liter V6 and 5.7-liter Hemi V8, a GMC Sierra with a 6.2-liter V8, and a Nissan Titan XD packing a 5.6-liter V8. The only full-sizer missing from this contest is the Toyota Tundra, and in the spirit of transparency, the trucks have a very wide range of options such as gear ratios and 4WD running gear that can drastically affect acceleration. It should also be noted that the action takes place at IMI Motorsports Complex near Denver, which is just shy of a mile above sea level. Such altitude means the boosted Ford EcoBoost V6 has a significant advantage over the naturally aspirated competition. In other words, this is a cool drag racing video showcasing the latest trucks, but your results may vary depending on options and proximity to the ocean. Since the racing isn’t held at a proper drag strip, we also don’t have the benefit of seeing elapsed times or speeds. However, these conditions are very similar to what you might experience on the street as opposed to a prepped track, and there are a few results in the melee we find very interesting. We’ll let you revel in all the drag racing action without spoiling the results. We’ll just say this – having a V8 pickup might make you feel all macho, but it won’t necessarily give you the win. Especially when the race is held over 5,000 feet above sea level and the competition shows up with turbochargers.